We are offering our stand alone cozy 3 bedroom house sitting in the hills above Sunset Beach and Pipeline. Ideal for one person, one couple, or 2 couples. Larger parties can rent the A-frame cottage which is also on the property. 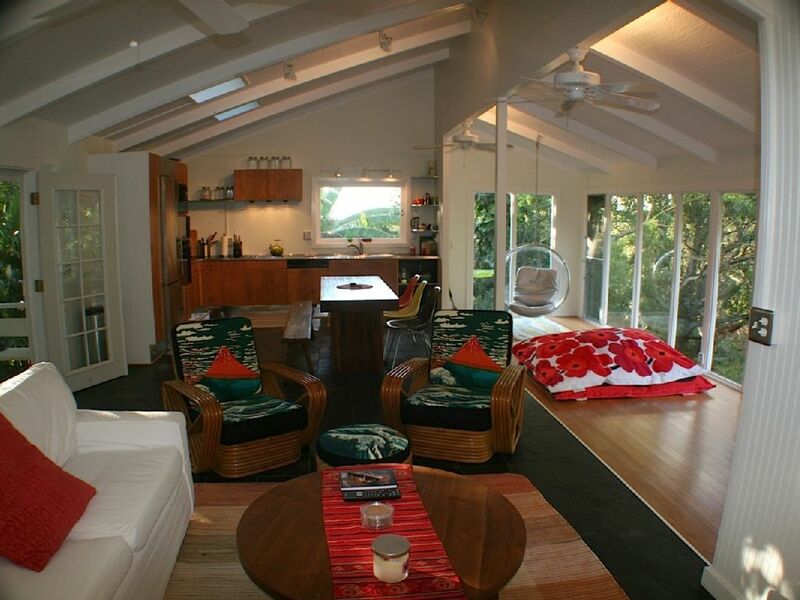 This remodeled house sits on over 2 acres of botanical gardens and is very private. The perfect hideaway only 5 minutes drive from the beach. We rent by the month. We just returned from the most amazing Christmas vacation! The house is absolutely beautiful with views that truly make you feel like you’re in the middle of the jungle. My wife, our three daughters, and myself had plenty of room to move about yet still cozy enough to enjoy each others company. The house is conveniently located close to all the great beaches, shopping, landmarks etc... yet it was great to retire at night to a beautiful home that feels a million miles away from the hustle and bustle. Overall we had a dream vacation which was made even more amazing because of the wonderful accommodations. I give it a big two thumbs up!!! We enjoyed our stay in the big house. It is clean, comfortable and well equipped. You must have a car since it is a 2 kilometre walk to the coastal road along a road which has a steep incline with hairpins and no sidewalk. No taxis. Don't ignore the warning about ants. Our family of four (two adults and two kids, ages 13 and 10) spent ten days at Hillside Modern Ranch. With only a couple of caveats, I recommend the property highly. We planned our trip to the North Shore of O'ahu last minute. How lucky we were to be able to rent at the top of Pupukea Road in a creatively designed home, surrounded by lush vegetation and a feeling of great privacy. Todd's house is located a couple of miles up the hill. This means we were close to beaches, grocery, food trucks and the main road, while still being in what seemed like our own private domain. Coincidentally, the road we were on was close to three great activities: a wonderful hike, a historic Hawaiian archaeological site, and a horse back riding outfit. One side of the house is essentially windows that look out on a tropical forest. Not many window shades, so the sun arrives early, but the view is well worth it. The sound of birds and light rain pattering on the leaves greeted us daily. The rain was welcome, as it never lasted long, cooled things off, and allowed for the greenery. We were able to make simple meals. The kitchen is well-stocked with dishes, glasses, coffee maker and cooking equipment. The TV worked fine. We were able to use the available boogie boards, chairs and umbrella. Caveats are few, but here goes: Be sure to bring your own beach towels; though this is mentioned in the list of house rules, it is somewhat "buried" in the information. It would help if the cleaning staff made sure all the lights were functional and the burners in place for the next set of guests. Lastly, the dryer was not functioning during our stay. We were able to use the one at the adjacent property, but this meant lugging our clothes at inconvenient times and having to make multiple trips to check on things. As previous renters stated- pictures don’t do it justice. Perfect size for a family of four and just minutes away from the beach, food trucks, and a grocery store. The geckos 🦎 surrounding the property were very cool! Open the windows at night and you’ll wake up to the sounds of the exotic birds- and of cours a rooster. A great place to stay! We loved it! We spent a wonderful month up in Pupukea. The house was beautiful, clean, surrounded by nature and tastefully decorated. Its built on a hillside in the forest surrounded by huge trees. Very easy going owner. No complaints about anything. Floor to ceiling windows througout make it feel like a much glorified tree house. Great outdoor & indoor showers. Maybe too much $$, but highly recommend. Thanks Todd for your hospitality. We had again another great trip and stay. Love the property and all of its beauty. Cant wait to return!! !